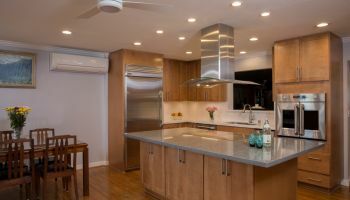 When one Mililani family realized that their desire to host friendly gatherings and fabulous dinner parties was being hindered by the hassle they felt in tackling a kitchen remodel that could fit all of their invited guests, they decided to remedy their quandary with a call to professional designers and remodelers Homeowners Design Center. With the help of these highly skilled experts, the homeowners were able to incorporate all of their exact wants and desires into their kitchen remodel, including adding a stylish—and quite grand—island that was perfect for food preparation, and would later be able to be used as an actual dining table, complete with ample seating for up to 8 guests. 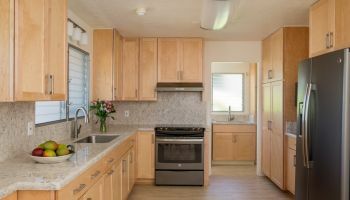 Jessica Omoto, a designer at Homeowners Design Center, describes the initial Mililani kitchen as being one which the homeowners felt was inadequate for their culinary and social hosting needs. “The kids were grown and gone away to college, and they were ready to remodel what has always been a family home into more of their dream kitchen,” says Omoto. “So we took down a wall to go ahead and open that space up and to combine the living room/entertaining area along with the kitchen.” For the Mililani homeowners, the ability to interact with their guests at all times while hosting get-togethers was a top priority for the kitchen remodel, making the new, free flowing and open, airy feel of the kitchen a perfect fit. The large island became the focal point of the space; able to comfortably seat eight with the stovetop at the center. “This island is one of the biggest islands I’ve ever done,” marvels Omoto of perhaps the most impressive feature of the kitchen remodel. “It seats 8 people, so it’s like having a full-size dining table—with a cooktop included in it, so they could actually have 8 guests around the island while they are cooking!” The thoughtfulness and practicality of this design by HDC enabled the family to now entertain with ease, operating out of a kitchen that now seamlessly blends both the socializing and preparation aspects of hosting guests at their hale. The cabinetry, recessed lighting with pendants and Kitchen Aid appliances were also facets that HDC put careful thought into. “Because we had an island, we didn’t want to take away from too much cabinetry or counter space … for instance, we were careful to place the microwave on the wall,” says Omoto, who also mentions the separate stove and hood’s incorporation into the island as a space saving part of the design in the kitchen remodel. For space saving measures, the size of the island dictated how and where the cabinetry would be placed as well as the appliances. For the cabinetry, says Omoto, “The homeowners wanted to go with a more rich coloring, so we used [Diamond brand] cherry cabinets with a cinnamon stain, which enhances that natural red, to give it that richness without being a bright red.” The basic plywood and dovetailed drawers also aided in creating a kitchen where form and function were both celebrated. The Cambria engineered quartz countertops in a color named Shirebrook were chosen by HDC for both beauty (the movement and unique veining encompass all colors of the kitchen) and low-maintenance purposes. Also easy to upkeep is the vinyl plank flooring, which rounded out the kitchen remodel, and effortlessly compliments the lovely red tones of the cabinetry. Form and function was imprinted in the overall design of the kitchen remodel, as well as easy maintenance and upkeep. From the initial design to the final nail hammered, it appears HDC has thought of everything. Now all that’s left is for this Mililani family to enjoy hassle-free entertaining in their newly remodeled kitchen! To see more kitchen remodel projects by Homeowners Design Center, or to find out how they can help you with your kitchen remodel, just click on anywhere you see their name or “HDC“, or on any of the photos above.